The NEASPEC Nature Conservation Project on habitat rehabilitation and conservation for key migratory birds in North-East Asia aims to generate information of key habitats and improve multilateral and multilevel cooperation in North-East Asia. This Project involves carrying out surveys in five North-East Asian countries on key habitats of Black-faced Spoonbills, Hooded Cranes and White-naped Cranes. 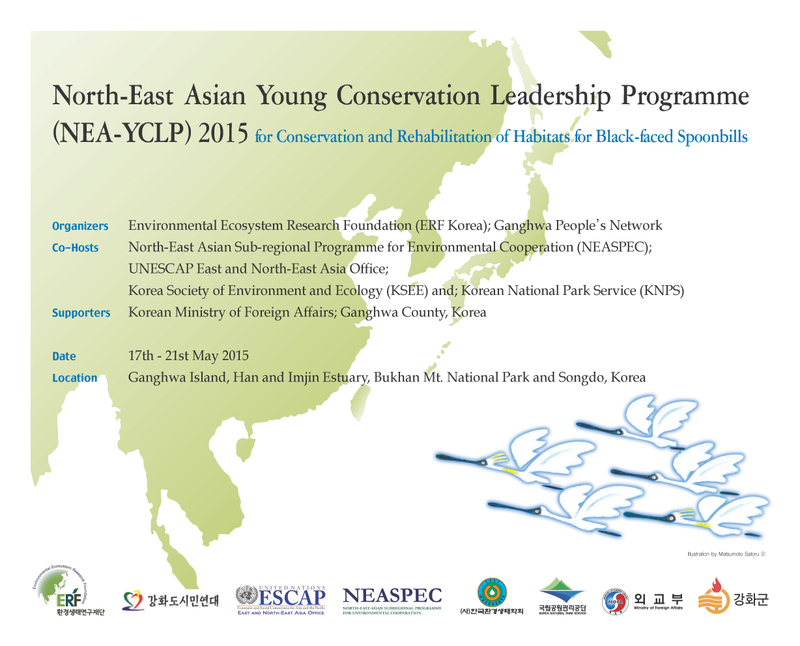 Under the NEASPEC Project, the North-East Asian Young Conservation Leadership Programme (NEA-YCLP 2015) targets young leaders working for migratory birds and their habitats in the subregion, will take place between 17 and 21 May in Republic of Korea. It will gather international young scientists and practitioners from North-East Asia, as well as international and national experts as trainers. The 5-day Programme will involve conservation history and challenges in North-East Asia; multi-layered and multi-lateral governance for conservation of migratory birds and their habitats; integrated ecosystem-based approach for habitat protection; biotope survey, habitat mapping and better land use; sustainable development for local community; conservation and management of boarder area, and; communication and education skills for conservation. 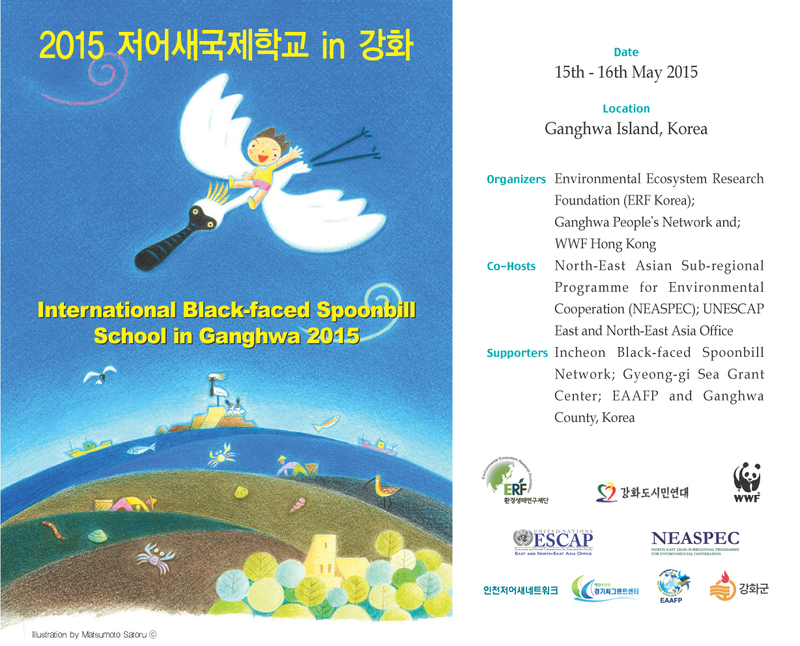 The Environmental Ecosystem Research Foundation (ERF Korea), a non-profit research organization based in Seoul; Ganghwa People’s Network, a local civic organization in Ganghwa Island, Republic of Korea; and WWF Hong Kong, in collaboration with UNESCAP-ENEA and NEASPEC is organizing the International Black-faced Spoonbill School in Ganghwa 2015 on 15th and 16th May in Ganghwa Island, Republic of Korea. The School will gather junior-high school students from Ganghwa and Incheon area, the main breeding ground of Black-faced Spoonbills (BFS), as well as educators from Republic of Korea, Japan, Taiwan and Hong Kong. This Programme will raise awareness for the conservation of Black-faced Spoonbills, which also represents endangered migratory birds in East Asia and implies on sustainable local community living with wildlife in the next generations. The School will be consisted of indoor and outdoor sessions on topics including life-cycle of Black-faced Spoonbills; BFS’s main habitat types; BFS and my town; BFS friends in East Asia; and field visits. The School will conduct in English and certificates will be awarded to participating students.